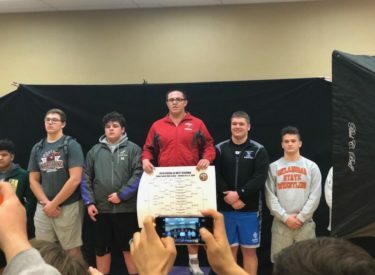 Six Redskin wrestlers make state. Here’s how they finished at Valley Center Regional. Chris Adame 8th, Edgar Bautista 7th, Carlos Mora 6th, Max Lugo 6th, Misael Monarrez 4th, and Elwin Trejo wins regional. Chris Adame (12-17) placed 8th and scored 4.00 team points. Jose Marino (6-19) place is unknown and scored 3.00 team points. Hugo Lopez (5-26) place is unknown and scored 0.00 team points. Jose Beltran (12-20) place is unknown and scored 1.00 team points. Emanuel Rivero (23-17) place is unknown and scored 3.00 team points. Carlos Mora (27-17) placed 6th and scored 9.00 team points. Max Lugo (9-10) placed 6th and scored 7.00 team points. Estefan Belmontes (4-15) place is unknown and scored 0.00 team points. Ivan Cruz (3-19) place is unknown and scored 3.00 team points. Misael Monarrez (32-7) placed 4th and scored 13.00 team points. Edgar Bautista (28-10) placed 7th and scored 5.00 team points. Elwin Trejo (30-7) placed 1st and scored 28.00 team points.